Pheasant Suites Bed & BreakfastPheasant Lodge Serviced Apartment is situated in the grounds of the non working Balls Farm. 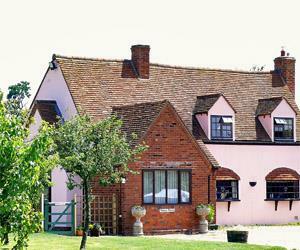 The 17th Century farm house is surrounded by fields and wildlife and located less than 2 miles from the centre of Colchester and Essex University, a mile from the village of Elmstead Market, Beth Chatto Gardens and only 15 miles from Harwich. It is on the edge of Constable Country. Pheasant Lodge is completely separate from the main residence with its own entrance and parking, the 55 square metres of luxurious ground floor accommodation includes an en-suite bathroom, two double beds, flat screen TV and wireless internet access. Pheasant Retreat Serviced Apartment, which overlooks the fields, is completely separate from the main residence with its own entrance and parking. It has a super king size bed, designer en-suite bathroom with an enormous bath and a separate shower. There is a kitchen area with hob and microwave. The private garden is equipped with a large day bed for 2, table and chairs and loungers. It also has a safe, wireless internet and air conditioning. All of our Suites are equipped with the following:- Heated towel rails, robes, slippers, toiletries, big fluffy towels, electric blankets, settees, china, cutlery, glasses, bottled water, biscuits, fridge, iron and ironing board, hair dryer, flat screen TV, DVD player, CD or IPod player and binoculars. They also have independent heating systems. No children. Cycle storage available. Pheasant Retreat Serviced Apartment, the ultimate romantic experience. Offering complete seclusion and privacy the Retreat overlooks the fields and is completely separate from the main residence with its own entrance and parking. It has a Super-King bed and designer ensuite bathroom with an enormous bath and separate shower. There is a kitchen area with hob and microwave. The private garden is equipped with a large day bed for two, table and chairs. It has a safe and air-conditioning. Check in time is not restricted which makes it ideal for Wedding nights and Honeymooners. Luxury continental breakfast available upon request. Take A133, leaving Colchester towards Clacton. Go past Essex University and take the left turning immediately at the end of the dual carriage way, marked Tye Road. Do not go into the village. Balls Farm is the second entrance on the right hand side, half a mile down.